After a long break, I have returned! With a review of a very enjoyable book. 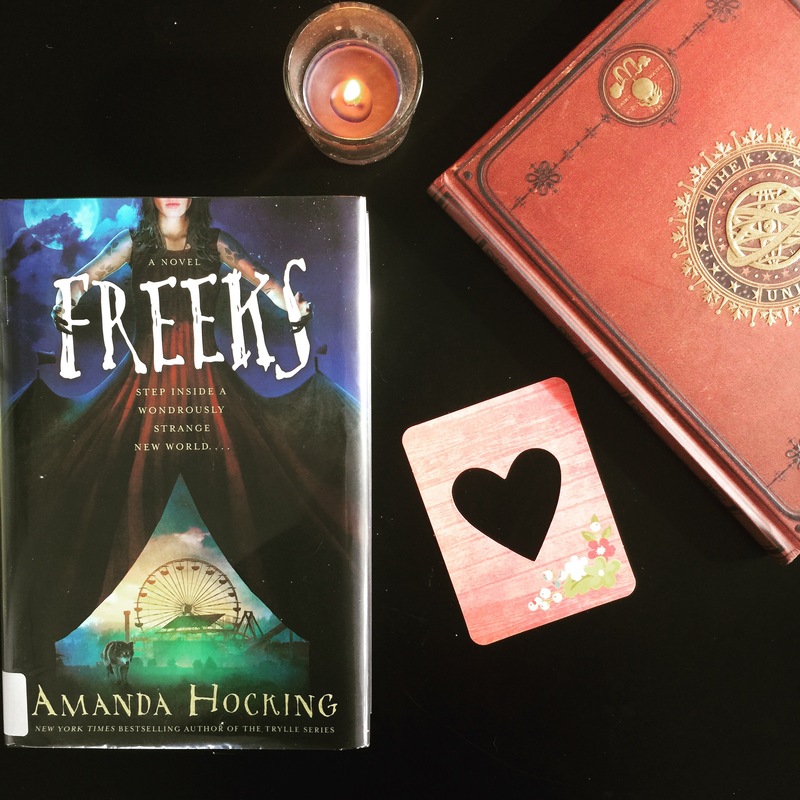 Freeks was released on January 3, 2017 and is a standalone novel by Amanda Hocking. I read it on January 12, 2017. I feel like I’m always reading series and this was such a self-contained story that felt like a balm for my brain. This is not a great summary, but it’s better than the one I tried writing. This is a fun story in a familiar kind of setting. I recently read the Summer Days and Summer Nights anthology, and the short story “Brand New Attraction” by Cassandra Clare laid out the concept well – “It was a dark carnival. You know the drill.” We do know the drill, and Hocking doesn’t waste time setting up the mysteriousness of the carnival, but rather outlining the supernatural abilities of the members, and establishing their close ties and relationships. I wouldn’t say that the carnival of Mara’s universe is dark, but it has its secrets. I don’t know why Hocking chose to set this story in 1987, but there’s a little bit of a Star-in-the-Lost-Boys feeling to Mara (appearance and dress mostly,) and god help me I was picturing a buff Steve Harrington from Stranger Things as Gabe (it may have been the mentions of fabulous hair.) I have to say, I love how suddenly we as a pop culture are excited about the ’80s again. Gabe’s house was also a fun setting – antebellum mansion with 1987 decor and art is quite the contrast to picture. One of the best things about this book was the path of Gabe and Mara’s relationship, particularly physically. It was realistic (not saying it was right or smart, but realistic.) One of the things that pisses me off the most in YA is the lack of kissing. Not because I’m like “Oh squee kisses!” but because teenagers kiss each other. A lot. Before they should. Because they are struggling under an insane hormone cocktail and a lack of impulse control, and physical affection is fun. There’s a tendency to delay first kisses for ages even when the characters have clearly expressed feelings and attraction, and I think that it’s false tension. Not so in Freeks – the first night Mara and Gabe meet they make out, I think it was in less than the first 30 pages, and my first thought was – hell yeah, this is such a relief! It’s also pretty clear that Mara doesn’t trust people or give in to her impulses very often, so I think it also established early on that something with Gabe is different. While Freeks is not a groundbreaking novel, it definitely has its own spin and flavor on carnival lore, supernatural abilities, and demonology. The characters are believable and sympathetic, and their relationships and histories established without extensive back story, and no flashbacks. There’s enough lore in regard to Mara’s family and the town of Caudry that the breaking point that leads to the final battle is strong, and a little scary. It was fun to read, and took my mind over and away while I was cozied up on the couch reading it. I stayed up way past my bedtime to finish it, and that doesn’t happen to me very often. I really love my sleep. There’s one thing that I keep going over in my brain, and I can’t decide if it’s a like or dislike. In a lot of books I’ve read recently, I feel like a lot of time is spent on knowing every single little detail about every character – and when the characters are interesting, it’s fun to fall down that rabbit hole. In Freeks, characters are tantalizing because we are given just a brushstroke of who they are – they aren’t central to the emotional plot, just the big picture resolution, so there really isn’t a narrative justification for knowing them more in-depth. For example, Gabe’s sister Selena. She wasn’t what I expected her to be and I wanted to know more about her, but there was no narrative reason for more to be revealed. Same with Gabe’s parents – I knew what Mara needed to know. There was no giant exposition from Gabe about his family that didn’t have to do with resolving the thing terrorizing the carnival. My curiosity was not sated, but even though I’m still curious, I’m not disappointed. Hocking stayed so tightly true to Mara’s perspective, and it’s just frankly awesome writing, and awesome choices. And I know I started this saying that I didn’t want a series, but I would read the hell out of a book about Elissar, Mara’s great-grandmother. She sounds like a badass. Overall, Freeks gets 4.5/5 rating from me – that half off because some things felt a little too rushed, and even the awesome writing choices can’t override the almost step into Chosen One territory. Still, another solid piece of writing from Amanda Hocking and a fun foray into the genre of dark carnivals.